"The villianous mobster, Al Capoche, has caused the farmers' vegetables to come to life. Now Capoche and his vegetable mob threaten to overrun the whole town. Only you can stop Capoche and the forces of evil!" 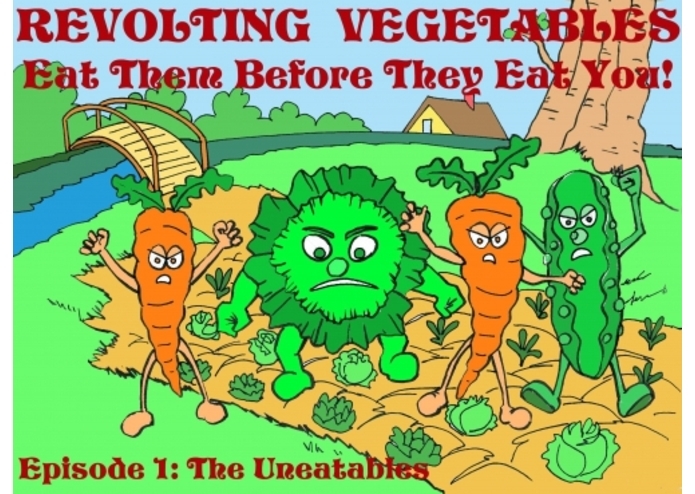 Revolting Vegetables is an RPG where the player levels up by eating a balanced diet. The player must meet all of the food requirements for each level, but if they go over the calorie limit then all of their progress is reset. The player encounters vegetable monsters and other characters along the way on their quest to defeat the evil cabbage, Al Capoche. The player acquires vegetables and money from defeating monsters, and they must use the money they've gained to buy other types of foods to meet all of the leveling requirements. Making food group education fun.